In the light of Salesforce.com’s swathe of announcements at Dreamforce last week and other recent developments, it’s a good time to take stock of the platform-as-a-service (PaaS) landscape. What are the choices now available to developers and business people looking to build applications on a ready-to-run cloud platform? As part of this review, I’ll report back on how PaaS vendors responded to my prediction last week of a shake-out following Salesforce.com’s database.com announcement. [Disclosure: Salesforce.com part-paid my travel expenses to attend Dreamforce]. In an astonishing turnaround within the space of a year, Force.com has gone from being a wholly proprietary platform to being remarkable in its support for open-source code and frameworks. Developers now have the freedom to build their Force.com applications in code that’s theoretically portable from one PaaS provider to another, or to their own in-house infrastructure. Even though the avoidance of lock-in is more illusory than real, given the practical obstacles to actually transferring an operational instance from one platform to another, the die has now been cast in favor of PaaS standards that are not the sole property of a single provider (with the valuable side-effect that the influence of competition makes such solutions cheaper). When selecting a PaaS platform, the lesson is that you should always look for the option, if only in theory, to move to another provider without having to completely rewrite your application code. RightNow CX Cloud Platform was unveiled in the summer as “the first platform to be purpose-built for customer experience.” This takes all the ingredients of RightNow’s customer service application — the knowledgebase, the various business objects for interacting with customers, the integration APIs — and allows customization to adapt to specific business processes or vertical needs, such as healthcare. Remote support vendor NTRGlobal unveiled a modular new platform in October with an API that allows partners to incorporate its functionality into tailored solutions. This applies the principle of PaaS to a very narrow functional scope. Now even enterprise software giant SAP is getting into the act, preparing to offer Business ByDesign in a PaaS model for partners to customize and verticalize. And then of course there’s still Saleforce.com’s original Force.com, which remains available alongside the vendor’s newer and more open PaaS components. Force.com is a very mature, rich PaaS for those who want to build a classic forms-and-database SaaS application in the Salesforce.com mold. Perhaps we need a new term — App-PaaS? — for this more functionally specific layer of application-platform as a service. In exchange for working within the functional constraints of the given platform, developers gain speed-to-market and the ability to focus on bringing their expertise to the business process layer rather than having to build the whole application infrastructure on the more toolkit-oriented vanilla PaaS offerings. 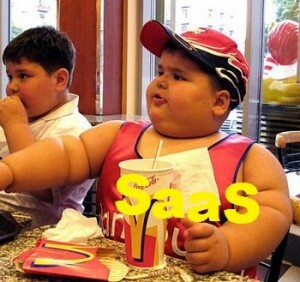 This layer of PaaS appeals especially to SIs, small ISVs and solution providers who serve vertical markets. It does a require a leap of faith in the platform provider — the lock-in is terminal — but for many the payback of getting to market quickly is worth that compromise. One word of caution for anyone evaluating these platforms is a reminder to look beyond the pure functional scope of the application they want to build and also consider the as-a-service capabilites and platform bandwidth of the underlying infrastructure. I’ve written before about the crucial importance of these elements for successful delivery of a viable cloud application built on PaaS. Let me know your thoughts. What criterion is required or optional?